How do you truly walk in another person’s shoes? The concept is simple to understand, but it’s not as easy as it sounds. We’re not talking about a pair of size 10 Nikes. 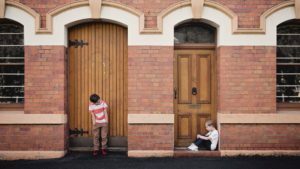 The idea of ‘walking in another person’s shoes’ is to develop empathy for others by experiencing the beliefs, perceptions, and culture of another person. The Naval Postgraduate School Center for Homeland Defense and Security (CHDS) Advanced Thinking in Homeland Security program (HSx) is an 18-month collaborative program designed to build our understanding of future security challenges facing the nation and global community. In what’s commonly referred to as a “Grand Challenge,” HSx participants are required to identify and research a complex issue that has potential to affect homeland security. The techniques they apply in addressing their grand challenge provide a foundation that can be used to understand and solve many different types of issues. So it shouldn’t come as a surprise that a group of HSx graduates were awarded grand prize in the HeroX Building Empathy Challenge. Image from the virtual reality app that HSx participants Merideth Bastiani and Michael Brown provided with their submission in the HeroX Building Empathy Challenge. Sponsored by KEO Marketing, the purpose of this competition is to design an application that allows users to develop empathy by experiencing another person’s life. The team was comprised of Merideth Bastiani and Michael Brown (both are NPS-CHDS master’s graduates and HSx participants). Bastiani, who is a Manager of the Child Care Subsidy Program with the New York State Office of Children and Family Services, served as the Team Lead for the project. Their grand prize-winning submission is titled “GREENER: The Other Side of the Fence.” GREENER is a two-tier Virtual Reality sandbox style app that rewards and instills empathy through simple, user-generated tools that enable a player to walk in the shoes of someone else. It immerses the player into others’ experiences, showing that the grass may or may not be always greener on the other side of the fence. 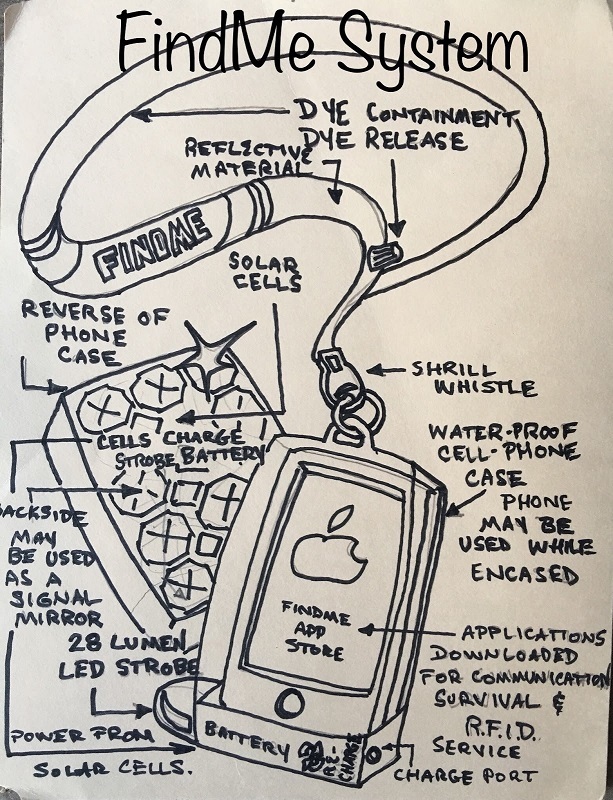 Artistic rendering of the FindMe System created by HSx participant Andre Billeaudeaux for the USCG Ready for rescue Challenge. The Ready for Rescue Challenge is a competition to create solutions to make it easier to find people in the water. According to the competition’s website, the ideal solutions are effective, affordable, and have potential applications for recreational boaters. “Sometimes the best ideas are the ones that are the most simple and right in front of us,” Billeaudeaux noted. 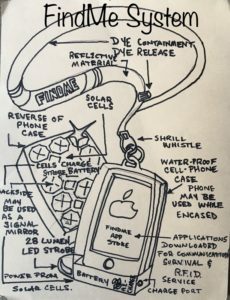 “In the FindMe case, our diverse team focused on re-imagining how previously disparate and previously non-associated maritime elements might be brought together to give scared and desperate individuals a better chance of survival in an often-deadly aquatic environment.” The FindMe System (FMS) is designed for broad appeal to all types of recreational boaters and includes a lightweight waterproof pouch with powered rescue light, signaling mirror, dye-pack lanyard, and survival apps.